Cover of the ‘collectors’ edition. As frequent visitors of ‘The World of Cosey’ will know, I don’t give summaries or reviews of the albums. I take some items from the albums that I find remarkable. I hope these items will invite you to (re)read the album and like it even better! For ‘Celle qui fut’, I have 4 things I like to explore with you: the young Jonathan, two typically ‘Cosey-esque’ story elements, the comics in Jonathan’s suitcase and an implicit promise made in this album. One of the most remarkable features of this album is the appearance of the young Jonathan. We learn that Jonathan’s parents worked in Delhi for a year. Jonathan goes to school there, and during the summer period, he goes to a boarding school in the cooler mountains. In this school, he meets April, the other main character of this album. For the second time in the Jonathan series, we see the young Jonathan. In the very first album ‘Souviens-toi, Jonathan…’ we see an even younger Jonathan (12 – 13 years old). In the flashbacks in ‘Souviens-toi, Jonathan…’ that show Jonathan as a young boy, he meets a Tibetan refugee girl, Saïcha, during a vacation in Switzerland (Saïcha lives at a refugee ‘colony’ in Switzerland). The meeting is ‘the most important of his life’, he tells April a few years later in India. April remembers this some twenty years later, so what Jonathan told her must have made an impression on her. We know what happened to Saïcha: she went back to Tibet and worked as a medicine-woman for the Khamba, who were fighting the Chinese at the time. Jonathan went to Tibet in search of Saïcha. He finds her and they fall in love (or were already in love years before, we don’t know). This causes the jealousy of Khamba fighter Tsaring, who was promised to Saïcha when she was only 9 years old. Finally, we know that the Khamba village was bombarded by the Chinese, that Saïcha was killed and that Jonathan lost his memory. The Jonathan series starts when Jonathans escapes from the psychiatric hospital trying to restore his memory. 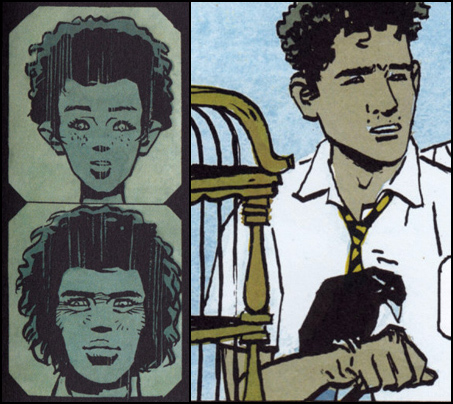 At the top left: Jonathan at the age he meets Saïcha (12 – 13 years); at the bottom left: Jonathan at the age he decides to go to Tibet (images from ‘Souviens-toi, Jonathan…’); at the right: Jonathan at an age between these… 15 or 16? (images from ‘Celle qui fut’). 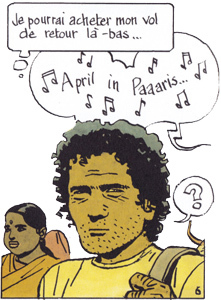 In ‘Celle qui fut’, we learn that after the vacation where Jonathan and Saïcha meet, Jonathan stayed a year in India. ‘Celle qui fut’ allows us to calculate the age of Jonathan with some accuracy. He met Saïcha when he was 12- 13 years, in Switzerland. Let’s assume that Jonathan stayed in India a few years later, 15 -16 years old. The story of ‘Celle qui fut’ plays ‘almost 2 decennia’ after this year – so Jonathan must be 35 at the most. Surprisingly young – isn’t it? Anyway, Jonathan has lived through all his adventures in just 15 to 17 years: that’s what I call a full life! 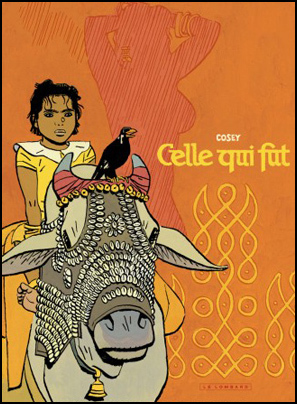 I want to highlight two typically Cosey-esque story elements that appear in ‘Celle qui fut’. The first one is the ‘bathing woman’. In ‘Celle qui fut’, Jonathan has recurrent dreams of a woman under a shower – at first, we don’t know who she is). She even appears on the cover of the ‘collectors’ edition. This is a favourite way of introducing female characters in the works of Cosey. In ‘À la recherche de Peter Pan’ we see Evolena bathing in a hot spring. In ‘Le Bouddha d’Azur’ we see ‘Lhahl’ taking a bath, in a hot spring, too. The woman in ‘Celle qui fut’ is another of the women who love to take a bath in the open air. Remarkably, two of them are singing or whistling; the only silent woman, Evolena, prefers piano playing… which brings us to the second Cosey-esque story element. 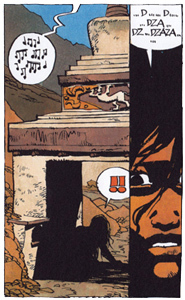 In ‘Atsuko’, Jonathan hears a song or a sung prayer. Jonathan follows it and he finds Atsuko. A few days later he hears the music again, and it makes him leave the house, following traces in the snow to find an intruder. He falls in an abyss. Atsuko tries to find Jonathan, following his traces. She looses the traces, and the music leads her to a house in the woods. In ‘À la recherche de Peter Pan’, Woodworth hears a piano playing in the Grand Hotel – later he finds out it was played by Evolena. In ‘Le Bouddha d’Azur’, Porridge recognizes Lhahl as the girl who spied on him in the mountain cabin, when he hears her sing ‘Love-me-do’ of The Beatles (she sings while bathing in the hot spring, as you could see above). In ‘Celle qui fut’, it is the singing of ‘April in Paris’ by the bird Garuda that distracts Jonathan from his planned journey to Delhi. He recognises the singing bird as the companion of April, the girl he knew 20 years earlier. Jonathan buys the bird and starts his quest for April. The music is the spark that ignites the motor of the story. In all cases, music is an important story element. Music is used as a trail to guide (quite literally!) the protagonist or to distract him from his plans, or it is used as a point of recognition. In ‘Celle qui fut’ it is both: ‘recognition’ (the bird belonging to April) and ‘change of plans’ (let’s find April). It is tempting to guess which other 4 comic albums Jonathan would have brought to India. After meeting Saïcha, the Tibetan refugee girl, it seems impossible that Jonathan would leave without ‘Tintin in Tibet’ in his luggage (number 11). 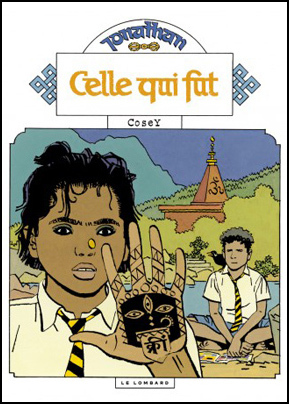 Jonathan brought ‘Tintin – Le Temple du Soleil’ to India, which is the second volume of Tintin’s Inca-adventure. He must have brought the first volume ‘Les 7 boules de cristal’ with him, too – I don’t think Jonathan would leave with only half a story (number 12). These are the easy ones – but which albums could have been the numbers 13 and 14? Coming from Switzerland, Jonathan would include an album by Switzerland’s only professional comics artist at the time and ‘teacher’ of Cosey, Derib. ‘Buddy Longway’ was created in 1974, which seems a bit too late; could it be an album of ‘Pythagore’ or ‘Yakari’ (number 13)? Finally, album number 14? My guess: a ‘Ric Hochet’ album by… Tibet. The story of Jonathan and Saïcha, the very first Jonathan story we know, comes to surface several times in ‘Celle qui fut’. When Jonathan finds April, April says she will tell all of her history from school time till now. She adds: ‘after that, it is your turn’. Later, when she and Jonathan walk through a pine forest, she asks if Jonathan knows anything about the ‘little Tibetan refugee girl’; if he has ever met her. April says: ‘You said she was the most important encounter of your life. You were 12 or 13 years old!! You wanted to go to Tibet with her…’ Jonathan offers to tell her about it, but April holds off. At the very end of the album, she asks Jonathan: ‘And now, do you want to tell me the story about your Tibetan friend?’ Jonathan answers: ‘Why not…[…]’ In the closing ‘voice over’ of the album, Jonathan says: ‘Maybe the moment has come? Back home? For some time at least […]’. This ‘back home’, we have seen it in the beginning of the album too, when Jonathan appears to be on his way to Europe for some months (the singing bird Garuda changes his plans). Is this a promise of a European episode of Jonathan? About what happened between him and Saïcha? All quotes are my translations based on the french editions of the albums ‘Souviens-toi, Jonathan…’ and ‘Celle qui fut’.